CARLSBAD, Ca. (March 19, 2019) – He’s only 17 years old and just on the doorstep of an NHL® career, but today The Upper Deck Company is proud to announce that junior superstar Alexis Lafrenière will join the premier trading card and collectibles company as an exclusive spokesperson, alongside many of the greatest names in sports including Michael Jordan, Tiger Woods, Serena Williams, LeBron James, Connor McDavid, Ben Simmons, Patrick Roy and Wayne Gretzky. Lafrenière was selected first overall by Rimouski Océanic of the Quebec Major Junior Hockey League (QMJHL) in 2017, where he went on to win the QMJHL & CHL Rookie of the Year award with 42 goals before being named to the QMJHL First All-Star team. 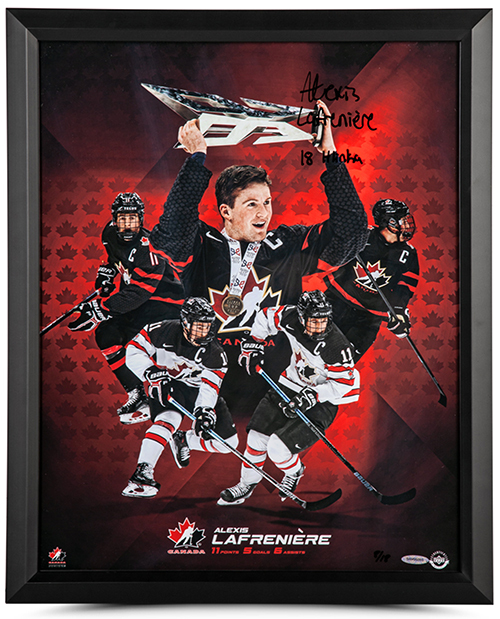 At just 16 years old, Lafrenière was the youngest player selected for Team Canada's 2018 IIHF World U18 Championship team. He has represented Canada at multiple events, including the 2018 Hlinka Gretzky Cup and the 2019 World Junior Ice Hockey Championships. Lafrenière is expected to be a top pick at the 2020 NHL Draft. The Upper Deck Company, headquartered in Carlsbad, California, is a worldwide sports and entertainment company built on the pillars of quality craftsmanship, authenticity and innovation, with a dedication to creating products that turn memorable moments into collectibles. Upper Deck is home to the world’s greatest athletes, including Michael Jordan, Serena Williams, Wayne Gretzky, Tiger Woods, Connor McDavid, LeBron James and Ben Simmons. Find more information at www.upperdeck.com, www.UpperDeckBlog.com or follow us on Facebook (UDAuthenticated), Instagram (UpperDeckSports), Twitter (@UpperDeckSports), and YouTube (udvids).